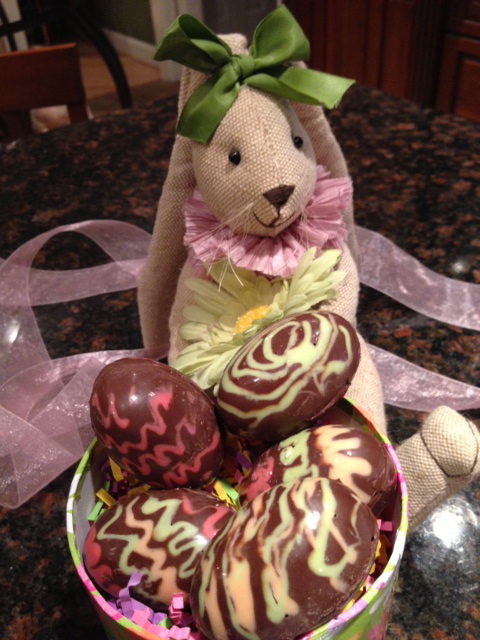 I had so much fun making those chocolate covered eggs that i did not stop there and ventured to make some chocolate shells to make chocolate eggs. 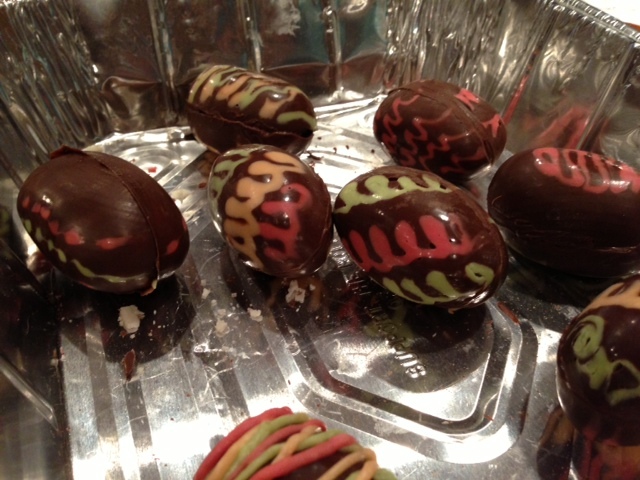 I will tell you that the process itself was a bit long as I wanted to create different patterns on my eggs, but it was fairly easy and much much fun. Of course everyone enjoyed receiving those eggs as they were made especially for them, and with much love and attention. I dare you to try to make some next year with your children, they are a bit of a change from the colored eggs that we all are used to make. 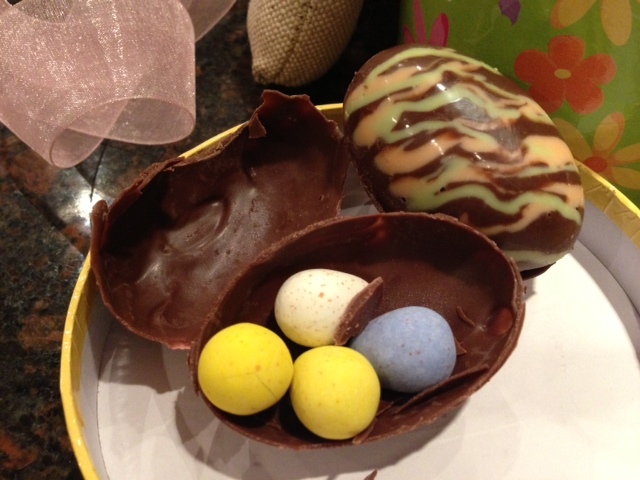 a bag of Easter eggs ( either jelly beans or chocolate) – I used Cadbury.. 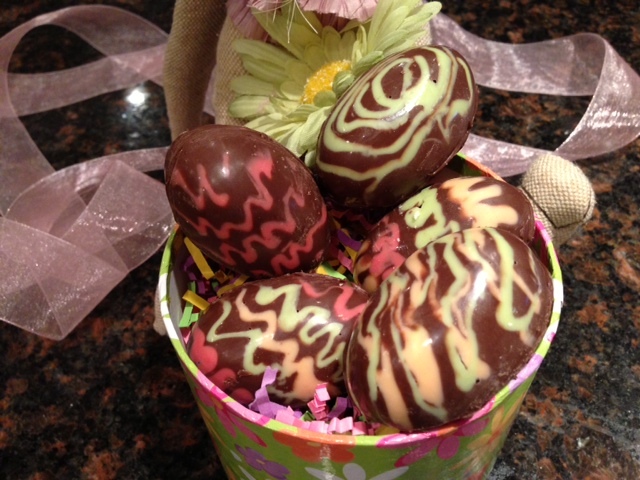 Melt 1/4 cup of vanilla chocolate bark and mix in some coloring of your choice to make the color of your choice. 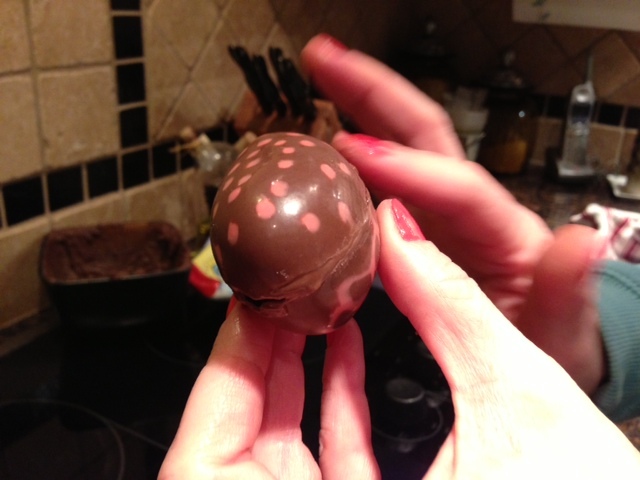 Place this melted chocolate into a plastic bag, or a pastry bag and drizzle this chocolate in the inside of the egg prints of the egg tray. Repeat this process with all the colors that you want, to make various drawings or designs. Place the tray into the fridge for a few minutes to cure the chocolate. Meanwhile warm up the chocolate in the microwave for 90 seconds and stir. Warm up the chocolate at 30 seconds increments to make sure that it does not burn, and do this until the chocolate is completely liquid and free of lumps. Let the chocolate cool until it is lukewarm. Warm the chocolate again in the microwave to make it liquid ( this process will guarantee your eggs to stay firm, and the chocolate to stay shiny). Either pour some chocolate inside the egg shapes and move the egg around so that the chocolate will cover the entire shell, or use a pastry brush and paint the inside of each egg shell. Place the tray inside the fridge to cure the chocolate for a few minutes. Place the tray inside the fridge for 8 hours or more. The next day, place a pot filled with water over a hot stove and bring the water to boil. When the water is boiling, place a lid upside down onto the pot. 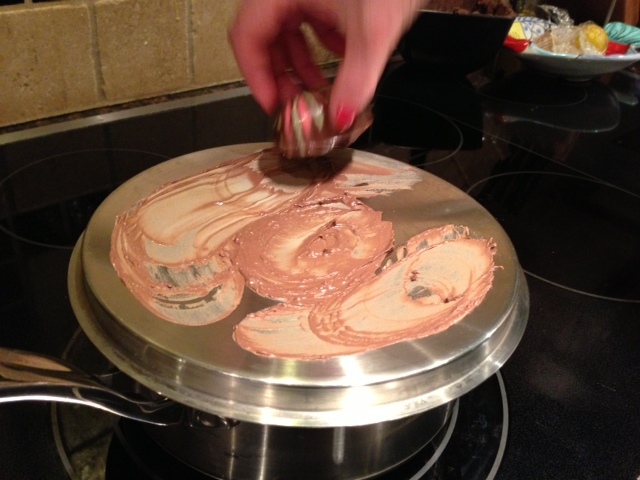 Get an egg shell and quickly place it onto the lid to melt the chocolate. Quickly grab another egg shell, place a few small eggs into the egg shell, place the other egg shell with the melted chocolate and keep it together to close them. 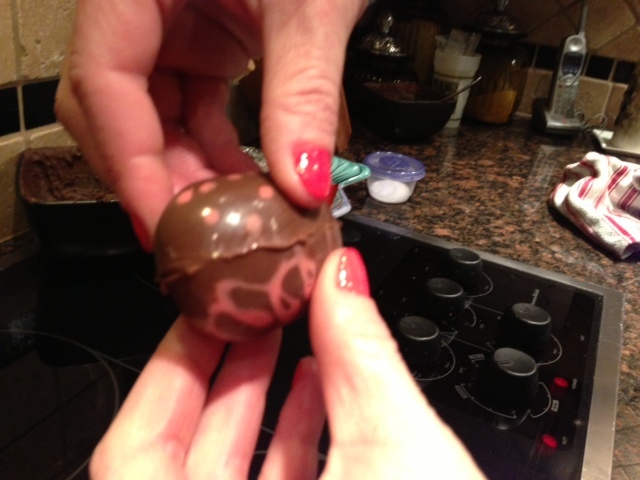 With your fingers, wipe the chocolate around the eggs to close the seam. Repeat this process with all the eggs. Place the eggs into the fridge to cool, and keep them into a cool place until you are ready to give them out.